McDonald's needs to shape up in creating content that engages the public for the Games, having fallen behind other official Olympic sponsors like Samsung and Visa, according to research from WE. Despite having one of the more recognisable brands of the official global sponsors of the Games, McDonald's has struggled to deliver on engagement in the run-up to the Olympics, according to the agency's Brand Agility Index, which looks at a range of metrics including scalability, relevance, speed and engagement. A key challenge flagged up by the index was the brand's inability to challenge the criticism it faced in 2012 too – why a fast-food brand is sponsoring the world's biggest sporting event. Jamie Oliver has even voiced his desire to take his healthy food campaigning to the Olympics in a bid to stop McDonald's and Coca-Cola from sponsoring the Games unless they meet certain nutritional standards. McDonald's has been a sponsor since the mid-1970s. Brands can score a maximum of five points for each of the ten parameters analysed in the index, so there is a maximum score of 50 available, scored by WE’s in-house insight and analytics team. McDonald's scored ones and twos across the board - and was particularly low on sentiment, engagement and its ability to stand out. WE pointed out that it was not new for McDonald's to field criticism for its role in sponsoring sports events, but said it was surprising that the brand had not cooked up a strategy for dealing with the negativity. Of tweets mentioning McDonald's and the Games, 80 per cent have expressed concern about its place as a key sponsor. 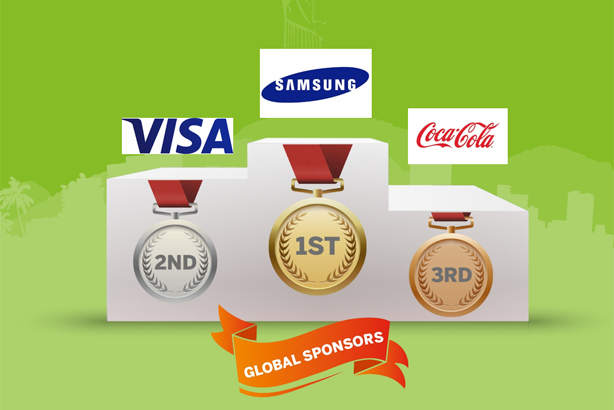 Looking at which other global sponsors are in better shape, Samsung is currently a clear frontrunner after its pre-Olympics preparation paid off, notably its The Anthem video, incorporating all of the competing countries’ national anthems into one. It scored particularly highly on originality for the concept. Visa also pulled ahead on originality after releasing The Swim, which tells the story of Yusra Mardini, a swimmer on the refugee team who once pushed a sinking refugee boat for three hours to help save 17 others. WE noted that the fact Visa had helped to create a refugees team has resonated with the public, achieving a wide range of engagement. Turning to partners of the British Olympic Association, Nissan’s prank videos with Team GB were particularly memorable as actors posing as global sponsorship representatives asked nonplussed athletes to do increasingly bizarre things in the name of getting the Nissan brand visible. There is still time for the underperformers to turn things around though. The Brand Agility Index will be updated each week until the Games end.